A study suggests that people who are most distressed during a heart attack have higher levels of particular chemical markers in their blood. 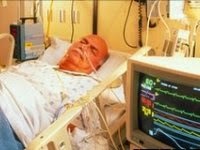 People with an intense fear of dying during a heart attack could suffer a worse outcome, research suggests. London-led researchers asked 208 patients to rate their levels of fear following a severe cardiac event. People who reported they were most distressed during an attack had higher levels of chemical markers - linked to inflammation - in their blood. Writing in the European Heart Journal, the authors say heightened inflammation may lead to poorer long-term health. "Large inflammatory responses are known to be damaging to the heart, and to increase the risk of longer-term cardiac problems such as having another heart attack, " said British Heart Foundation professor of psychology, Andrew Steptoe. The research, led by a team at Imperial College, found that patients who reported an intense fear of dying had raised levels of TNF alpha - a marker that has been linked to inflammatory processes in the body. They also measured heart rate variability and the stress hormone cortisol, three weeks after the event. Professor Steptoe, who worked on the study, said: "Fear of dying is not just an emotional response, but is linked into the biological changes that go on during acute cardiac events. "This is an observational study, so we do not know whether helping people overcome their fears would improve the clinical outlook." Dr Mike Knapton, associate medical director at the British Heart Foundation, said: "This study suggests that people who are most distressed during a heart attack have higher levels of particular chemical markers in their blood, which are associated with greater inflammation in the body. "Inflammation has previously been linked with an increased risk of heart attack but we don't yet fully understand why. "What we need to know now is whether we can allay people's fears at the time of a heart attack and whether this actually translates into better outcomes in the long term."